Green juices and power smoothies are fabulous, but they’re not the only healthy drinks out there promising to quench your thirst and offer inspiring health benefits. Tonics and elixirs, a potion of adaptogens, juices, and superfoods, have become popular once again. The difference between elixirs and tonics is that elixirs are a healing remedy consumed to treat a condition, while a tonic is consumed to promote overall health and balance. I find the whole notion of medicinal herbs exciting. Are they as powerful as ancient Chinese and Ayruvedic medicine suggests? I’m not sure, all I know is it creates a space of fantasy and magic in my everyday life. If I can drink a tonic that should make me feel more balanced, hand it over! I enjoyed my first tonic at abcV, a plant-based restaurant in New York. They have a great selection of restorative tonics using an array of esoteric ingredients such as catuaba and damiana. I had my second tonic experience at Dimes Restaurant, which consisted of Chlorella and apple cider vinegar (ACV), which inspired my tonic recipe. I drink a lot of kombucha and this drink tasted similar because of its strong vinegar flavour. It occurred to me using ACV is a quick cheat to making a gut boosting drink. ACV is also great for balancing blood sugar levels, boosting your immunity, and aiding in your bodies detoxifying process. When purchasing ACV look for unfiltered with the mother (I prefer Bragg Brand), it has not been pasteurized and therefore has healthy bacteria for your gut. 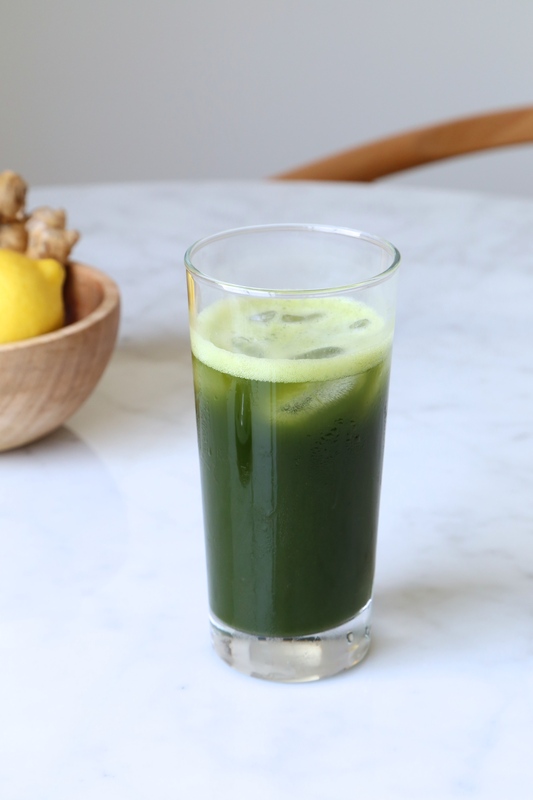 Chlorella gives this drink its super nutritious profile. It’s a fresh water algae, cousin to spirulina, that is considered one of the most nutritious and potent foods on earth. Chlorella is a rich source of chlorophyll making it an amazing detoxifier. My favourite benefit is it’s believed to make you look younger by slowing down your bodies aging process. Chlorella reduces oxidative stress, that can be caused from pollution, stress, and a poor diet which causes aging. * Bring on the chlorella baby. The powerful flavour of vinegar may take some getting used to, but you can always add more water to thin it out. I prefer drinking this tonic with a splash of sparkling water. Next time someone suggests for you to drink lemon water or apple cider vinegar water tell them you have an even better recipe..aka this one. Place all the ingredients in a blender. Blend until smooth and frothy (we don't want tiny pieces of ginger). Enjoy cold over ice! Try adding sparkling water for a carbonated drink. This entry was posted in Drinks and tagged acv, adaptogen, chlorella, detox, elixir, superfood, tonic. Bookmark the permalink.